Today, I continue my series, analyzing the picks of every NFL team in the 2014 draft. Since these players have yet to set foot on an NFL field, I don’t do draft grades. I don’t believe a draft should be graded for at least two years, which gives players time to develop. The purpose of this article is to discuss the players drafted, how they may fit in with their new team and talk about the competition they will face to get on the field. Each article will focus on one division. 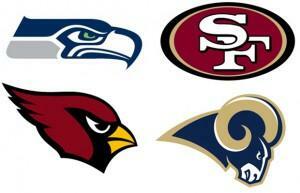 Today I look at the NFC West. The Cardinals added a physical presence to their secondary when they drafted Deone Bucannon. Bucannon likes to punish ball carriers. He is not great at man coverage, but he has good size and speed and will set a tone for the Cardinals defense. He should be a starter on day one and should also be a special team’s standout. Troy Niklas is a former linebacker that has only played two years at tight end. He is a very good blocker and may have been the most complete tight end in this year’s draft class. Niklas doesn’t have great speed, but he is good on short and intermediate routes and should be a dependable 3rd down receiver. The tight end position should be an interesting camp battle. The Cardinals already have John Carlson, Rob Housler and Jake Ballard. Unless they decide to go with 4 tight ends, one or more of the veterans may not make the roster. Whatever happens, I expect Niklas to get some reps this year, especially in multiple tight end formations. The Cardinals run a 3-4 defensive scheme and Kareem Martin has the body type teams like for a 5 technique. He is 6’6” and has 35” arms. His 272 pounds is a bit lighter than what you want, but he should be able to bulk up. Martin is a smart player with high character. He showed good lower body explosion at the Combine, recording a 10’9” broad jump (best defensive lineman) and a 35 1/2 “ vertical jump. The Cardinals starters are Calais Campbell and Darnell Dockett, but Martin should get some playing time in the defensive line rotation. John Brown is a small, quick, explosive receiver. He is only 5’10” and 179 pounds, however, he ran a 4.34 40 yard dash at the Combine. Brown is a fluid athlete, but he is very lean. He is also a good return man, so he adds value in that area. He has a good chance at making the 53 man roster, with only Larry Fitzgerald, Michael Floyd and Ted Ginn ahead of him. He should definitely see time in multiple receiver sets and likely as a returner. Logan Thomas is an intriguing prospect. Early in his career, he was looked at as a sure 1st rounder, and possible #1 overall pick. Thomas is a 6’6” 248 pound specimen that is a former tight end. When he is on, he looks unstoppable, especially when he is running the ball. Thomas never completely put everything together at the college level. He is going into a good situation with Bruce Ariens as his coach. Ariens is one of the best at developing quarterbacks. The Cardinals have Carson Palmer, Drew Stanton and Ryan Lindley ahead of him so there should be no pressure on him to get on the field early. Ed Stinson is a solid, underrated defensive lineman. He won’t produce huge stats, but he is a stout, productive player that can even slide into to play the nose in a pinch. Stinson has several players ahead of him on the depth chart, including fellow draftee Kareem Martin. My bet is he will be a practice squad player that could develop into a decent starter for the Cardinals in the future. Walt Powell is a small school player that is quicker than fast. He is an elusive player that can make people miss after the catch. I don’t see him as a player that makes the final roster out of training camp, but he could possibly be someone they stash on the practice squad. It seems like every year, the 49ers have double digit draft picks and this year was no exception, drafting 12 players. Jimmie Ward is a natural center fielder that flies all over the field making plays. He is an extremely hard hitter, but he has a slender frame that could be a concern. Ward has good instincts, does a good job jumping throws and breaks well on the ball. The 49ers have Antoine Bethea and 2013 1st rounder Eric Reid ahead of him on the depth chart. Ward will give them good depth at the position. Carlos Hyde is a Jim Harbaugh type of running back. He is a tough, downhill runner that pounds away at the defense. Hyde is like Frank Gore in a lot of ways. He will have Gore, Kendall Hunter and possibly last year’s 4th round pick Marcus Lattimore to compete with for a backup position. I believe he will see action this year and will be a good addition to the 49ers offensive backfield. Many people had Marcus Martin rated as the top center prospect for the 2014 draft. He is a versatile player that can play both center and guard. Marin has the size to go up against bigger nose tackles and match strength vs strength. He also has the athleticism and footwork to get to the second level and block linebackers. Daniel Kilgore is the starter at center and he is beginning his 4th season. Martin should give them good depth this year and possibly challenge for a starting job in the future. Chris Borland is too small and too slow, but all he does is show up around the ball. Borland was extremely productive for the Badgers and is the type of player that Harbaugh will fall in love with. With NaVorro Bowman suffering a devastating knee injury in the NFC Championship Game, Borland might get some playing time. The 49ers starters are Patrick Willis and Michael Wilhoite. Willis is a fixture at the Pro Bowl, but I think Borland could get some playing time next to him. Last year the 49ers picked Marcus Lattimore and stashed him away on the Physically Unable to Perform list. They will do the same thing with Brandon Thomas. Thomas was likely a 2nd or 3rd round pick until he tore his ACL in April while working out for the Saints. He played left tackle for Clemson, but will likely play guard at the next level, especially after the injury. Bruce Ellington is a small, quick slot receiver. He is an athletic player that also played point guard for the Gamecocks basketball team. Ellington has quick burst and acceleration and has good hands. San Francisco doesn’t have a great wide receiver corps, so he should be able to get onto the field. He will go into camp behind Michael Crabtree, Anquan Boldin, Jonathan Baldwin and Stevie Johnson. Dontae Johnson is a versatile defensive back that can play corner or safety. If he can play corner, his 6’2” size will be an asset when going up against large receivers. His ability to play safety and nickel back will make him a versatile player for the 49ers. He will go into camp competing for a job as a safety and will be behind Eric Reid, Chris Culliver, CJ Spillman and Jimmy Ward. Aaron Lynch is a transfer from Notre Dame that played one year for the Bulls. He has shown flashes of pass rushing ability, but did not have a great 2013 season. Lynch played defensive end in college, but it appears that the 49ers may try to convert him to linebacker. Lynch will have to compete with Ahmad Brooks, Aldon Smith (assuming he isn’t suspended), Corey Lemonier and Dan Skuta for a roster spot. Keith Reaser is another pick with next year in mind. Reaser tore his ACL in October. After surgery, he was invited to the NFL Combine where he learned that his body was rejecting the graft from a cadaver that was used to repair the ACL. Reaser underwent a second surgery in February and will not likely play this season. Kenneth Acker is an underrated corner that was not invited to the Combine. He doesn’t have great speed, but he has good footwork and instincts. He will be competing against starters Tramaine Brock and Chris Culliver and backups Perrish Cox, Darryl Morris and Chris Cook for a roster spot. Kaleb Ramsey has the size to play defensive end or nose tackle. Ramsey is a raw player with good strength and quickness. It will be tough for him to make the final roster coming out of training camp, but he could catch on with the practice squad. Trey Millard is a very versatile player. He can block, catch and even run the ball when needed. Millard is tough, hard nosed player that I think Harbaugh will really like. He will start off training camp behind Bruce Miller and Will Tukuafu, but don’t be surprised if Millard doesn’t make the 53 man roster. The Seahawks lacked a 1st round pick and with their first pick in the draft, they selected Paul Richardson. Richardson is a lean, fast receiver that can stretch the field. He has long strides that chew up a lot of ground. His size and durability are concerns, but there is no denying his explosiveness. Richardson will go to training camp behind starters Percy Harvin and Doug Baldwin and backups Jermaine Kerse and Ricardo Lockette. With his ability to go deep, I look for him to get playing time in multiple receiver sets. The Seahawks drafts are always interesting and the pick of Justin Britt falls into the category. Not many teams had Britt rated as a 2nd rounder, but I stopped criticizing Pete Carroll’s drafts a long time ago. Britt has the size for a left tackle (6’6” and 325 lbs. ), but he may be more suited for the right size. Going into camp, Britt will be listed as a backup to the starters, Russell Okung and Michael Bowie. Cassius Marsh is a high effort player that is a little bit light for defensive end and lacks the athleticism to play linebacker. However, Carroll is known for putting together packages with multiple pass rushers. Marsh will go into camp as a defensive end and will start off behind Michael Bennett and Cliff Avril. To make the club, he will be competing with Greg Scruggs, Benson Mayowa and Jackson Jeffcoat for a backup spot. Kevin Norwood is the second receiver taken by the Seahawks in this draft. Unlike Richardson, Norwood has good size. He doesn’t have Richardson’s speed, but he has very good hands and concentration. Norwood also runs great routes. I wouldn’t be surprised if he made this team. Kevin Pierre-Louis put on a show at the NFL Combine. He is very athletic and has fluid movement skills. Pierre-Louis could excel as a weak side linebacker when he is allowed to run to the ball and use his athleticism. Going into camp, he will be behind Bruce Irvin and O’Brien Schofield, but don’t be surprised if Carroll doesn’t find ways to get him on the field in special packages. Jimmy Staten is a small school player that was not invited to the NFL Combine. Staten will need time to develop and he will have a tough time making the 53 man roster. He goes into camp as a 5th string defensive tackle. Staten will be a candidate for a practice squad spot. Eric Pinkins is another candidate for the practice squad. He has a good combination of height-weight-speed, but he doesn’t have great agility and will need time to develop. Kiero Small is a former linebacker that is built like a bowling ball (5’8” and 244 pounds). His low center of gravity makes him a good lead blocker and he is a good short yardage runner. He will go into camp as the third string fullback behind Derrick Coleman and Spencer Ware. It will be tough for him to make the roster. Thanks to the Washington Redskins and the RG3 trade, the Rams had two 1st round picks for the second straight year. With their first pick, the Rams decided to help protect Sam Bradford by picking Greg Robinson. Some had Robinson as the best tackle in the draft. He is a massive 6’5” 332 pounder truly dominates defenders in the run game, but he doesn’t have much experience pass protecting. The Rams have Jake Long on the left side, so Robinson will be asked to line up on the right side which seems to be his best position. Auburn did not throw the ball very much, so Robinson will likely get better at pass protection with NFL coaching. With their second pick, the Rams decided to stay on the line and move to the other side of the ball. Aaron Donald was the highest rated defensive tackle. He is an explosive, disruptive 3 technique. Donald is extremely athletic and the 285 pounder even ran a 4.68 40 yard dash at the Combine. Donald should be a day one starter and team with Chris Long, Michael Brockers and Robert Quinn to give the Rams a 21st century version of the Fearsome Foursome. Larmarcus Joyner was a love ‘em or hate ‘em player for most people. The haters pointed to his 5’8” frame. I happen to love the way he plays. Joyner is a versatile guy that can play corner or safety with the ability to cover slot receivers. Joyner’s playmaking ability was the key to the Seminole’s defense. It appears that the Rams will try him at corner where he will back up Trumaine Johnson and Janoris Jenkins. I wouldn’t be surprised if he doesn’t end up nailing down the nickel corner position immediately. Tre Mason was the key to Auburn’s run to the BCS Championship Game. Mason has the vision to see holes open and the quickness to explode through them. At 207 pounds, he has a surprising ability to run between the tackles and find creases in the defense. Zac Stacy had a very good year for the Rams, but Mason should be able to get the backup job. Mo Alexander is a big, physical former linebacker. His 38” vertical jump shows good lower body explosion and his 4.54 40 yard dash isn’t bad for someone that used to play linebacker. Alexander comes with some baggage after being kicked off his team in 2012, but was reinstated in 2013. He will have a chance to get the backup strong safety job behind TJ McDonald and will likely be a good special teamer. E.J. Gaines is a confident player that adds swagger to a defense. Gaines raises the energy level of a defense and he loves to hit. He has experience covering slot receivers and can return punts. Gaines will have to beat the numbers game to make the 53 man roster. Going into camp, he has six corners ahead of him on the depth chart. He is a Jeff Fisher kind of player though, so don’t be surprised if he finds a way to make the team. Garrett Gilbert was drafted simply because of his pro day where he completed 87 of 88 passes. However, if you look at his college stats he only had one year where he completed more than 60% of his passes. Gilbert was the #1 rated quarterback out of high school, but he never lived up to those expectations. The Rams have Sam Bradford, Shaun Hill and Austin Davis ahead of him, so I will be shocked if he makes the team out of training camp, but they may put him on the practice squad and try to develop him. Mitchell Van Dyk is a small school player that will need time to develop. He has good hand strength and is a solid run blocker, but he doesn’t move well. Van Dyk is very raw having played at a small school and is likely a practice squad candidate. Christian Bryant is not big, but he plays bigger than his size. He has a smooth backpedal and plays the ball well in front of him. He will be behind TJ McDonald and Mo Alexander on the depth chart going into camp, but he has a decent shot at making the roster. Michael Sam was the SEC Defensive Player of the Year in 2013. He had 11 ½ sacks, 2 batted passes and 2 forced fumbles. Many people thought he would be drafted either in the 2nd or 3rd round until he worked out at the Combine. Sam did not work out well and looked extremely stiff at the Combine and his pro day. There was speculation that he wouldn’t get drafted at all, but the Rams decided to take a chance on him in the 7th. If he makes the team, it will be as a situational pass rusher. He will need to beat out William Hayes, Eugene Sims or Ethan Westbrooks to have a shot at making the final roster out of training camp. Demetrius Rhaney has good feet and moves well. He has a good combination of size, power and agility. Rhaney will have a tough time making the roster though, since he goes into camp behind Scott Wells, Tim Barnes and Barrett Jones. Next Wednesday, I will be posting my analysis on the AFC East. If you like what you read, please like us on Facebook and recommend us to your friends. This entry was posted on July 4, 2014 by draftmaniacs in Draft Analysis and tagged 2014 NFL draft, Aaron Donald, Arizona Cardinals, Arizona Cardinals draft, Carlos Hyde, Deonne Bucannon, Greg Robinson, Jimmie Ward, Lamarcus Joyner, Logan Thomas, NFC West, NFC West draft, NFL, NFL Draft, Paul Riichardson, San Francisco 49ers, San Francisco 49ers draft, Seattle Seahawks, Seattle Seahawks draft, St. Louis Rams, St. Louis Rams draft, Tre Mason, Troy Niklas.